As usual, Shell, I give reality 7 points out of ten, despite Virgina's lovely photo, and your version ten. The raspberry pink makes the red seem an embarrassing error. Oh! Oh! Kitty's hat, Kitty's hat! I am charmed, as though you've waved your magic wand. Mise ~ you made me blush. In raspberry pink. Heh, thanks, Petrea ~ I couldn't help myself! I agree that her Paris blog is special. Something else I need to spend more time on - in addition to your magical blog, ShSh. At first I thought that was a party hat and Kitty was still celebrating last week's anniversary. Another magical illustration. I agree Mise and Petrea - the raspberry somehow fits better and kitty is adorable! Cafe ~ hours in the day, so often a challenge. I'll see if I can conjur up any to help you out. Hiker ~ a dual-purpose cap ~ what great thinking! Thanks, Debs! Hope you've had a lovely weekend. I'm ready for a little magic. Count me in. Never been inside a magic shop. But once, on the way up to Yamashiro restaurant, I walked past The Magic Castle in Hollywood. First time I ever hiked up that hill. Will never do it again! We scared the hell out of the attendants at the restaurant. I'm guessing not many people came trudging up the hillside at night just to take a gander around the property. The view was worth it! Ms M ~ I was talking with a fellow cat lover today about how entertaining they are without having to do anything but 'be'. They are magical. Thanks, Favourite Vintage Finds ~ ironic that a mouse inspired the kitty's cap. ;) Hugs and brrts. Cali ~ she taps her paw and changes her cap to a raspberry beret when we aren't watching ~ just for her own amusement. ;) I looked up Yamashiro and Wow, those views are amazing. Such a delightful illustration. The pink awning really does make a difference. Paris needs more pink! 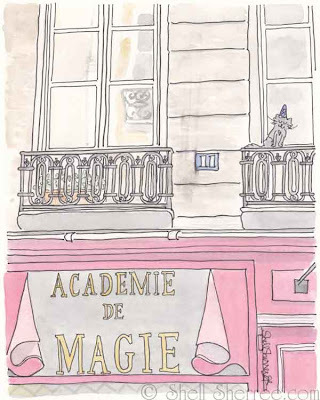 There's a magic museum in Paris that I didn't know existed. 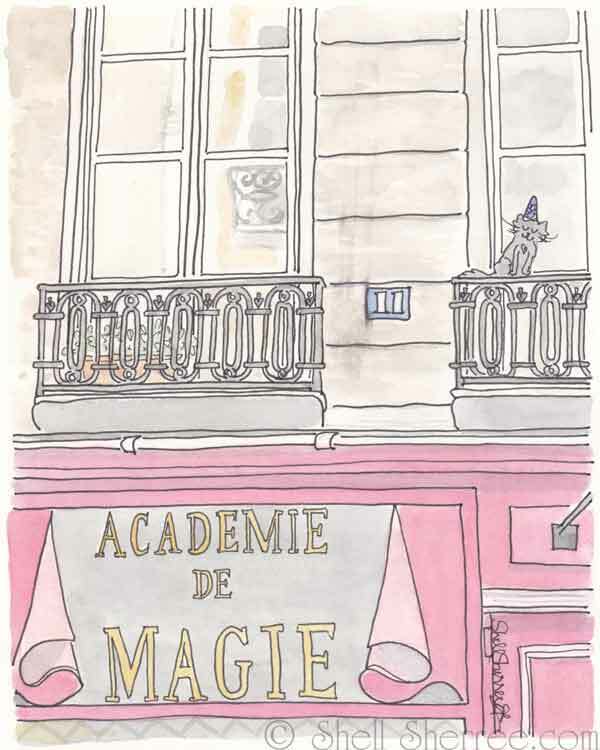 I wonder if the magic students at the Academie go there for field trips? Katie ~ going to a magic museum for a field trip? What fun would that be!! I didn't think kitty could ever be any cuter, yet there she is playing the wizard in her dual-purpose hat. Can Ramona borrow the hat for Halloween? Am I allowed to wear the raspberry Hunter boots with the pink-ruffled dress? Yes and yes, Susan! Absolutely.